"Nature has always been my teacher. and am constantly humbled by its beauty." "Mon" is short for "Monster", the nickname Brett Garling earned from his childhood fascination with animal specimens, bones and anatomy. The name stuck and Garling's fascination grew, culminating in his life-sized figurative and animal bronze sculptures. Along the way, he has maintained his devotion for all of nature with his plein air paintings of the landscapes of his native Australia. In 2004, Garling established a foundry, sculpture garden and gallery, the Garling Gallery, in Wongarbon, New South Wales. He has exhibited throughout Australia and is a member of the Sculptors Society and the Australian Plein-Air Artists Group. Garling was awarded a Fellowship by the Australian Institute of History and Arts in 2006, in recognition of his contributions to the field of sculpture. Garling wrote to us about growing up in a remote area of Australia and his earliest artistic inspirations. Read more about Brett "Mon" Garling's life and painting in our in-depth interview. The Artist's Road today by clicking here. Lucky You! You can go immediately to the full interview here. Mon" is short for "Monster", the nickname Brett Garling earned from his childhood fascination with animal specimens, bones and anatomy. The name stuck and Garling's fascination grew, culminating in his life-sized figurative and animal bronze sculptures. 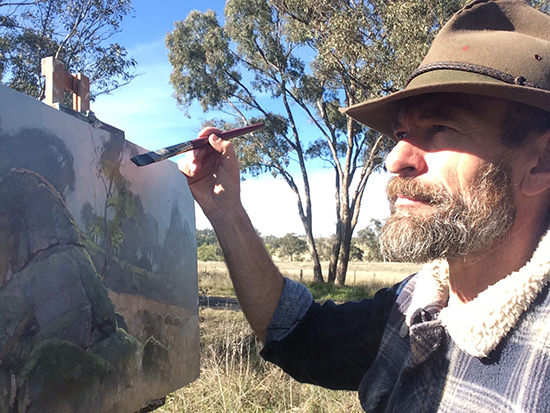 Along the way, he has maintained his devotion for all of nature with his plein air paintings of the landscapes of his native Australia.